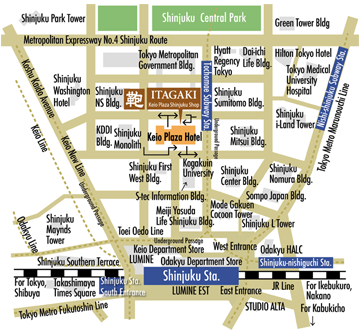 The Keio Plaza Hotel Shinjuku store, located in the hotel's South Tower lobby on the 3rd Floor, is a 5 minute walk from the JR Shinjuku Station's west exit or a 1 minute walk from the Toei Oedo Line's Tochomae station. 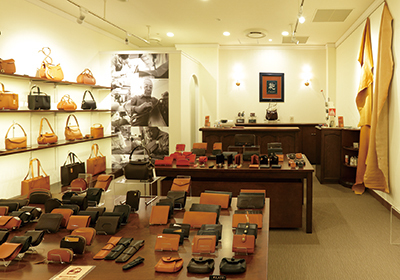 Showcasing Itagaki's Rugato and Brascott products in the center of the room, the store has a wealth of accessories and bags that are ideal for business, travel or as gifts and souvenirs. 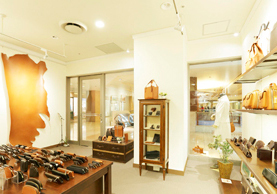 Please drop by and see us when visiting Shinjuku whether on business or while sightseeing. Introducing the Horseshoe emblem of the Keio Plaza Shinjuku store. 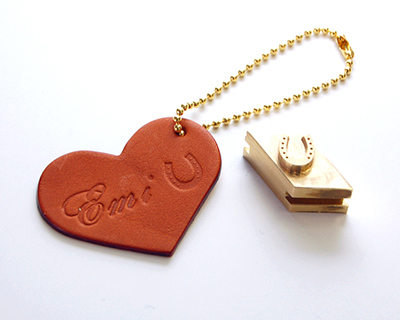 Each Itagaki store carries its own unique emblem which customers can choose to have embossed onto their store bought Itagaki products.The Horseshoe emblem is not available at other stores and serves as a unique reminder of your trip to Tokyo. ・For those travelling on the Keio Line, the Odakyu line, Tokyo Metro's Marunouchi line, the Toei Shinjuku line: Get off at Shinjuku station and walk 5 minutes to arrive at your destination. ・For those travelling on the Toei Oedo line: take the B1 exit and walk 1 minute to arrive at your destination.